Pioneers in the industry, we offer digital moisture analyzer, moisture analyzer, basic moisture analyzers, lab moisture analyzer and advanced moisture analyzer from India. To meet the diverse needs of our prominent customers, we are occupied in offering Digital Moisture Analyzer. Moisture in percentage amounts is monitored as a specification in commercial food production. There are many applications where trace moisture measurements are necessary for manufacturing and process quality assurance. We are among the most sought after offering Moisture Analysis to the clients. With the accuracy of an analytical balance, this humidity meter delivers exact results within minutes. Offered range is used in many domestic and industrial premises for analyzing the moisture present in various objects. 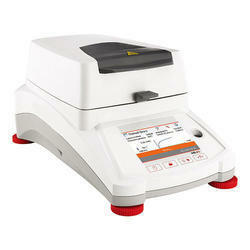 The outstanding performance and long functional life of our Basic Moisture Analyzers attract the customers most. 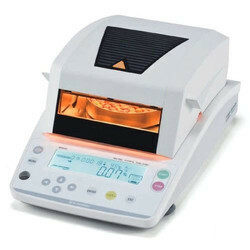 Manufactured using the best quality factor inputs and sophisticated techniques under the direction of vendors' experts, this analyzer balance is used in different industries like plastic, food, organics, rubber, chemical and research. Moisture ratio measurements are indispensable for quality control and as checks of raw materials in a variety of industriesincluding food products, chemistry, and pharmaceuticals.The MOC63u electronic moisture analyzer is capable of accurate, quick and easy moisture ratio measurements.Just place the sample in the sample pan and close the cover to start the measurement.This instrument can accommodate virtually any sample, and will contribute to enhanced user productivity. 1.Large sample pan allows even a large amount of sample to be placed evenly in a thin layer. The result is accurate and fast measurements. 2. Mid-wave infrared quartz heater provides effective drying without interference for a wide range of samples. Besides the excellent drying performance, it offers a long operational life of 20,000 to 30,000 hours. 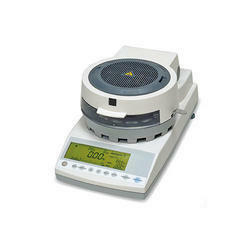 3.The internal precision weighing balance is engineered with a Shimadzu Uni Bloc cell. The mechanism provides excellent stability and a long operational life against repeated temperature changes. 4.Digital control allows a selection of measurement modes.10 sets of measurement settings can be stored for quick recall. 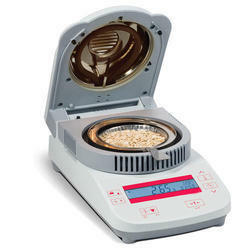 Select one of the 9 combinations of drying and halting modes to optimize the measurement of your sample. 5.Weight loss rate in the previous thirty seconds is monitored and visually presented in the bar graph display.This feature is especially useful to show that the measurement is close to completion. 6.Shimadzu’s unique Windows Direct function is standard.Measurement data can be sent to an application such as Excel® without any software installation to the computer.All you need to add is an RS-232C cable.If you'd like to use "Windows Direct" with "Windows 7", "Windows Vista", or a USB port, please contact our distributors.7. 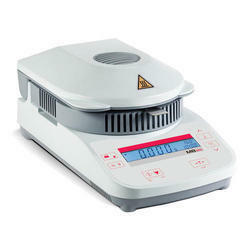 A larger sample pan contributes to accurate measurements, but the larger heat capacity normally produces larger zero drift due to temperature uctuation.The MOC-120H is equipped with a unique auto-taring mechanism, which adjusts the zero drift automatically and ensures high accuracy, even with a larger sample pan.8. Bias function allows adjustment to the data obtained by other measuring methods or other testers.9. Large backlit LCD is easily read even under poor lighting conditions.